This Limelight Precision was built as a 68/69 bass and we went to town on the specs. It has all the usual Limelight features but in addition also has the metal earthing plates under the pick ups, an extra added Jazz pick up in the bridge position ( a very popular mod back in the day) plus the extra knob required and side mounted jack socket. It also has a genuine Fender nitro-cellulose pickguard which are over £100 to buy new! If this spec was to be ordered today then it would cost over £1150! I’m offering it at a good price as I currently have 3 Limelight’s for sale and in stock, and usually I have none, so quick sale required. 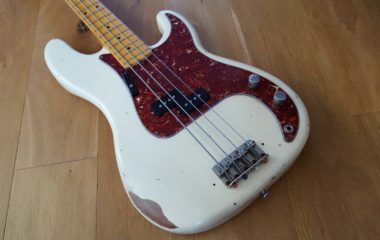 The bass is very heavy relic sunburst, with “J” width rosewood fretboard with clay dots and rolled fretboard edges, and has the usual high quality components such as CTS pots, Switchcraft jack socket and vintage wiring.